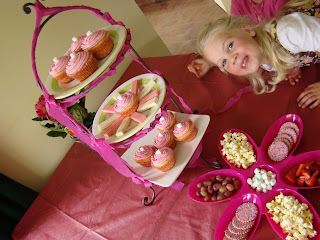 ... a couple of pics of the tea party! Here is Miss Emma jumping in the picture, already with something in her mouth and all the girls weren't even there yet! Talk about eager, or was that hungry? LOL! And here is candle time ... didn't realise that these are the candles that don't blow out easily - they keep relighting! Which from a photographer/scrapbooker point of view is actually brilliant coz I got 4 different shots of her blowing/reblowing the candles out!!!! Emma had a brilliant time and got some gorgeous pressies from her wee mates. Needless to say no scrapping was achieved, christmas cards still left to be written ... maybe next weekend. Thank you to Janine and Miss Meg for your Christmas cards, and also Trace for the blog award - I will endeavour to pass this on soon. Its all very pretty and pink - not hard to see why she loved it. Hope you are feeling better soon. Those cupcakes are brilliant!!!! Hope you are feeling better! I don't blame Miss Emma for jumping in quick - it all looks so attractive how could she resist! Sorry to hear you haven't been to well - do you know the cornflour 'trick'? A couple of teaspoons of cornflour mixed with cold water into a paste, then add milk and flavouring, (so it's a milkshake) - it thickens 'things' up just like in cooking. Hope you feel better soon chick. Such cute photos!! Love all the PINKNESS! Sorry to hear that you aren't well, I hope you feel better soon. Gorgeous! 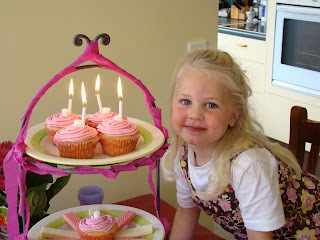 So pretty and pink ... and I want that cake stand! Good trick getting relighting candles ... it's always hard to click the camera at just the right time. Hope you're feeling better today. the tea party looked good.....sounds like it was a blast. Ewww at your tummy bug, thats not much fun at all. Hope your feeling better now.